There has recently been in the news a study that showed that people are keeping their vehicles for 6 years. Compare this to the 4 years people kept their vehicles just a short 8 years ago. What factored into this change? First, the economy. Even though things are looking better today, unemployment is still high and there is still a lack of confidence in the economy. Second, long loan terms. Now that you can finance a vehicle for 72 months it takes longer to gain equity in your vehicle. So people are hanging on to their cars until their are close to being paid off. Third, vehicle quality. The quality of most vehicles is better than it was. Build them better and they last longer. Regular oil changes are important because motor oil contains additives that have the ability to neutralize acids. Over time, these additives get used up and stop being effective. Also, oil can absorb water, dust and combustion byproducts and holds them in suspension. Eventually, the oil gets saturated and can’t absorb any more. When the contaminated oil remains in the engine it can cause corrosion. In today’s vehicles, the bulk of the ignition system maintenance involves spark plugs and wires. Worn or misfiring sparkplugs will cost you fuel economy and emissions performance. Most recommendations are to check the performance of your spark plugs at 30,000 miles and plug wires at 60,000 miles. Your local dealer can check this for you, also refer to your owners manual for manufacturer recommendations. A dirty air or fuel filter can cause poor performance, poor fuel mileage and reduced engine life. Changing your air/fuel filter is easy and rule of thumb is to change the air filter 12 months/12,000 miles or fuel filter 24 months/24,000 miles. 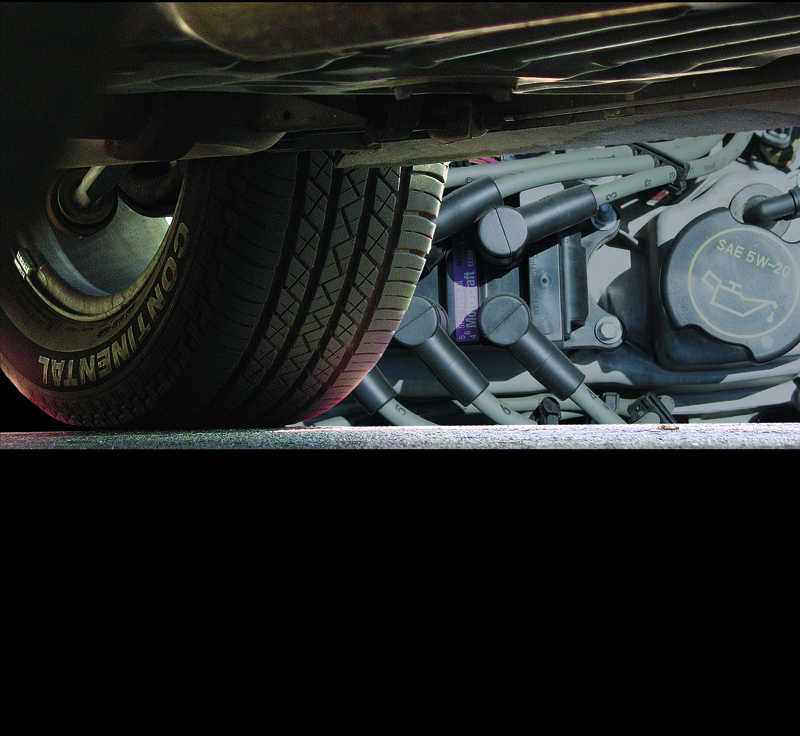 For the best information, again check your owner’s manual or ask your service advisor. We typically recommend you check the condition of your brake components anytime you rotate your tires. Make note of any unusual wear. Replace the pads when there is still a little of the pad left, wait any longer and you could damage the rotor. Especially check into those brakes if the brake pedal feels spongy when you use them, you hear unusual grinding or squealing, braking is hard or your brake light is continuously on. Tire Pressure Check: Maintaining the correct air pressure in your tires will not only help improve fuel economy, it will help your tires wear more evenly. The manufacturers put the recommended tire pressure on a sticker on the door jam. All you need is a simple pressure gauge and you can check it yourself. Tire Rotation: Our rule is to rotate the tires whenever you change the oil. This will help your tires last longer, saving you money in the long run. Transmission Fluid Change: Most newer vehicles don’t require or recommend a transmission fluid change. It is a sealed system that has the same fluid in it for the life of the transmission. If you have an older vehicle the standard is to change the transmission fluid and filter at 40,000 miles. I will go to our old fall back and recommend if you have any questions, refer to your manufacturer’s owners manual or ask your service advisor for help. Car Wash: The exterior of your car will not only look better, it will last longer if you wash your car regularly. Road grime and winter road treatments are hard on your vehicle, corroding whatever it touches. So give your car a good scrub – you will feel better once you do! That about covers everything. Servicing your vehicle properly will help keep it running better for you and help you get more for it when you decide to replace it down the road. If you have any questions about the maintenance of your vehicle, feel free to contact one of our service advisors at Waldorf Ford. We are conveniently located on Route 301 North in Waldorf, just 15 minutes south of Washington DC. This entry was posted in Ford, specials, Uncategorized, Waldorf, Waldorf ford and tagged air filter, ford, ford service, fuel economy, maintenance, maintenance schedule, oil change, sparkplugs, tire pressure, vehicle quality by Administrator. Bookmark the permalink.